For a Close Shave, It’s Captain America to the Rescue? – StratGo Marketing. Plug-in marketing department services. For a Close Shave, It’s Captain America to the Rescue? Why is there a Captain America comic book inside my Wall Street Journal? That’s what I wanted to know last week. The answer: Kiehl’s, the self-proclaimed “purveyors of the finest skin care” products, wants to boost sales with men. So they targeted WSJ readers in New York, Los Angeles and San Francisco on June 6th with a high-quality Marvel custom edition insert. It caught my attention for marketing investigation purposes. Call it content marketing, branded content or co-branding. 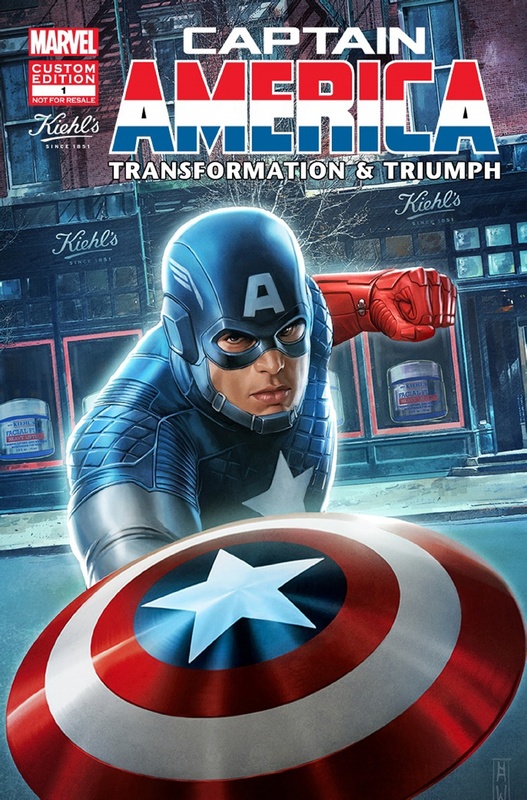 The “comic book” features a Captain America cover and 12-page custom comic book story, plus seven more pages of men’s skincare advertising from Kiehl’s, who claim they don’t advertise. I understand the marketing logic for high-end grooming products targeted to men who read The Wall Street Journal. The newspaper has frequent ads for premium-priced products, including for men. It’s hard to explain the comic book connection, though. Uh oh. This reminds me of the marketing fable where the golf-loving CEO tells his team to sponsor a professional golf tournament because, well, the sales team can entertain customers. I don’t get it. Maybe Kiehl’s mined some data and discovered that men who buy high-end skincare products like comic books. Branding. 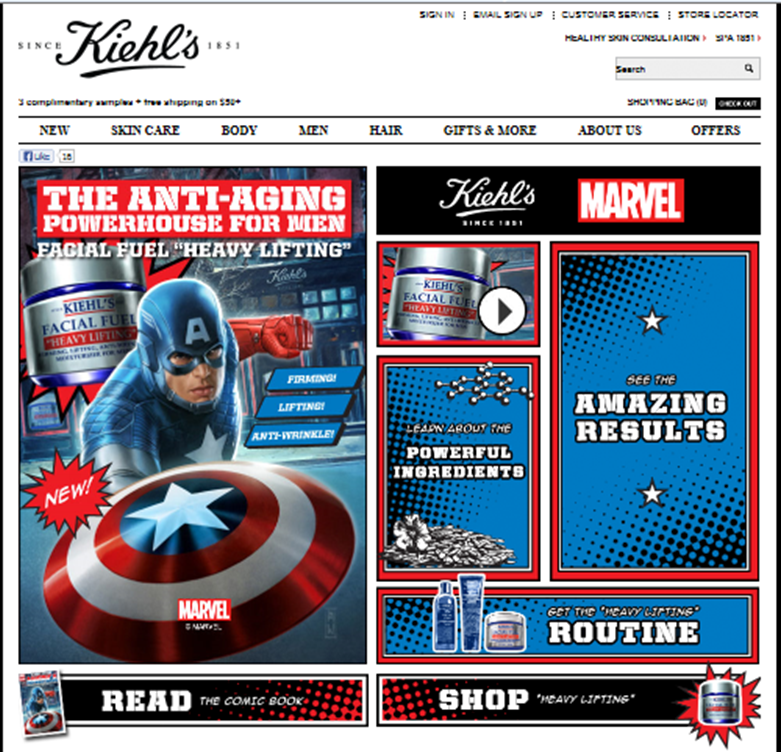 What do comic books have to do with the Kiehl’s brand? Communication Idea. Maybe the goal is to make an irreverent connection between the powers of Captain America and the efficacy of the products. If so, it makes the reader work way too hard. Context. How many WSJ readers simply tossed the comic book in the trash without a second thought because they were confused and/or time-pressed? Consider all the time and effort for development and approval. Ouch. Superhero or Product Hero? Even if readers got to and spent time with the product advertising (I mean product information), Captain America probably overpowered the product story. Maybe this comic book marketing is a smashing success. Only Kiehl’s will know if the investment ends up panning out. Still, give Kiehl’s credit for marketing experimentation. Unfortunately, from the outside looking in, Captain America seems like the wrong marketing vehicle. Despite all the powerful tools and creative interactive communication opportunities at our disposal today, marketing fundamentals still apply. It will always be about engagement and connection between buyer and seller, however that happens. I just don’t know that men who might buy high-end skincare products want to be engaged with Captain America. High-end skincare products seller Kiehl’s wanted to spike its men’s marketing with a custom Marvel comic book distributed inside Wall Street Journal newspapers in select markets. It was an interesting content marketing effort. However, what the heck is the connection between Captain America and Kiehl’s current and/or potential users? Kiehl’s apparently has a reputation for unconventional marketing (this is all new to me, being from flyover country). Google ‘Kiehl’s advertising’ and look at images – – for better or worse, they seem to thrive on constantly changing up their approach. Or maybe just saw the results for Old Spice in using Isaiah Mustafa, who is pretty darn close to a superhero himself. My gut is that skincare is a tough category for men … I have a feeling a lot of men don’t want to admit concerns about looking older/younger, and that there is an emotional need to give permission to even indulge the curiousity about the skincare products without feeling overly vain or unmanly. So perhaps, in a strange way, Captain America gives men permission to enter the category or at least educated themselves about it?